Today is my fourth-born child’s birthday. I don’t highlight all of My People’s birthdays each year because if I did I wouldn’t have enough weeks to blog about anything else. But last night I was unable to fall asleep and found my thoughts turning to my Joey. Sandwiched between three siblings on each side, Joey was the consummate middle-child peacemaker. Well, except for the day at age three when ruckus in his and 4-year-old Jesse’s room found me calling Benny on the phone to tell him his sons were in a fist fight…with Joey on top pounding on his much bigger brother. 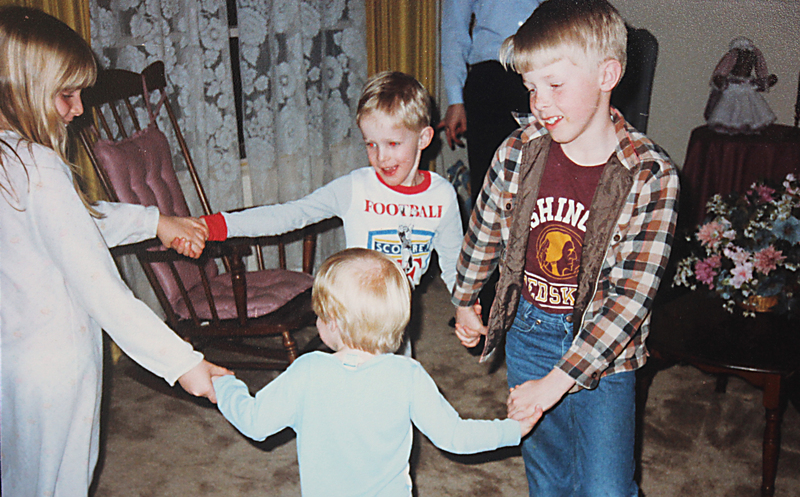 Joey (bottom right) loved playing with the older boys, especially big brother Jesse (middle, second from right). playing basketball. Nope, no smiles there. Who tells little boys not to smile while they’re playing sports? Actually, all my sons suddenly developed a “game face” when they got a basketball in their hands. They learned to love and proudly display that face. And to this day, years after the only games they play are followed by complaints about how old and slow they are, I almost always have to tell them to smile in pictures. I don’t get it. 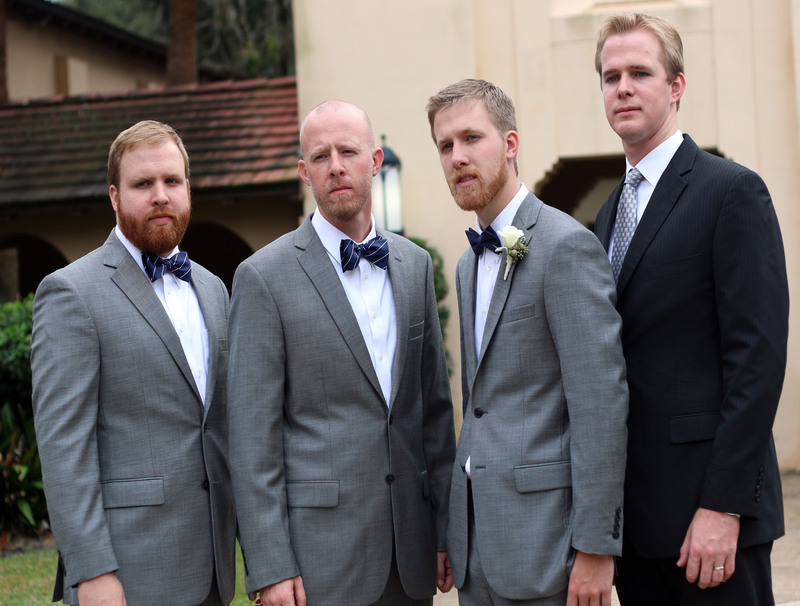 They insisted on a game face pic even at Jake’s wedding last month. After our move from Virginia to Florida when Joey was fifteen this mother and son became closer than ever. We were both homesick and would check in on how each other were doing. Just before the 3-year mark we were in the car during one of our many treks back and forth to the community college and I asked Joey how things were going. “Mom, this is starting to feel like home,” he said. I agreed. God had moved in both our hearts. I didn’t mind that Joey wasn’t too interested in getting his license until he graduated high school because it gave me lots of time to chat with a budding young man who I increasingly respected and who was okay about sharing his heart with his mom. Those eyes and smile captured Lauren’s heart, too. Then came the day when his heart was turning toward a cute brunette in our church. I won’t forget the night he made a customary stop into our bedroom to kiss me goodnight and sometimes chat with his dad and me about his day. That chat turned into a lengthy talk about Lauren. It seems an upcoming missions trip to Wales had him looking forward to spending some leisurely time with her to see if the stirrings in his heart would find their home in hers. They did. My son’s wise choice of a delightful, godly and fun wife resulted in Amelia Grace Phillips who may have Daddy’s coloring but certainly has Mommy’s love for dancing anywhere and everywhere, especially at Disney. Several years ago Joey surprised us all with a new “gift.” It came seemingly out of nowhere and we don’t really know what to call it; a sense of humor is too weak so maybe the “gift of wit” as one guy called it will suffice. 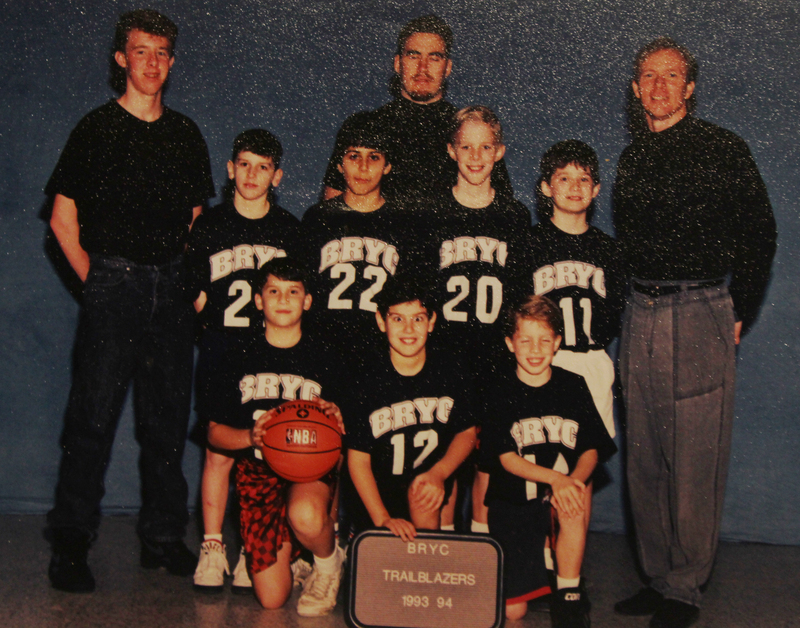 During his years of coaching high school basketball at our former church Joey started writing kinda true but humorously embellished recaps of the year to read at the annual sports banquets. While the room crescendoed with laughter as he read, Joey’s deadpan face remained unchanged. Those banquets produced requests to do his “thing” at birthday and engagement parties and for wedding toasts — and I’ve already told him his funeral debut will be for me. If you ever want a really good laugh that usually ends with heartfelt warmth let me know. I promise you don’t even have to know the people. My favorite memory of Joey so far is one that made me realize my boy had become a man. Benny and I had just learned some painful news about someone we love and needed to confide in someone trustworthy. I reached out to a couple of my kids, including Joey. 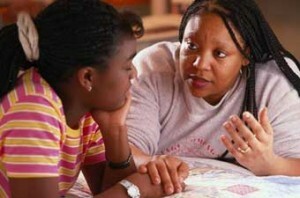 Looking back, it was the first time Mom went to the kid for help and advice rather than it being the other way around. Sitting in McDonald’s that night I was wisely and compassionately cared for by someone whose tender blue eyes searched my own to see how I was processing the news. Those same eyes had looked into mine hundreds of times over the years when he sat on my lap. Ran to greet me with outstretched arms when Benny and I returned from a trip. Silently begged me not to leave him in Sunday School before he compliantly turned to join his friends. Twinkled with joy when he made the select basketball team and later fell in love. And brimmed with tears the day we packed up his room (including a bunch of basketball memorabilia) to move into the first home he was about to share with his bride. That night the peacemaker reminded me that I could trust the One who promised a suffering, hurting mom-turned-counselee peace that passes understanding. And since then I have found timely hope in those tender eyes again and again even when no words are exchanged. Happy Birthday, Joey. 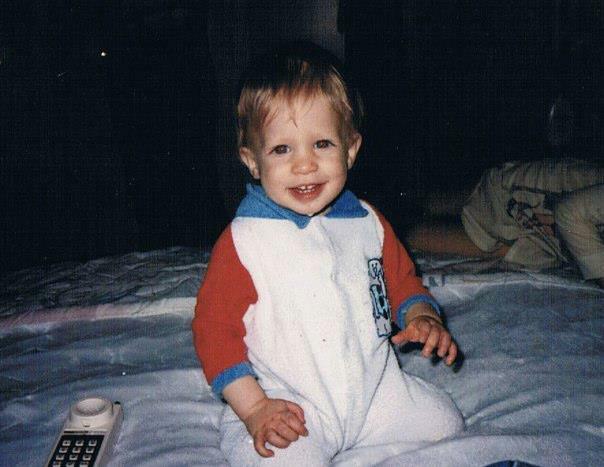 Twenty-nine years ago today God gave me a baby son who is now I man I deeply respect. 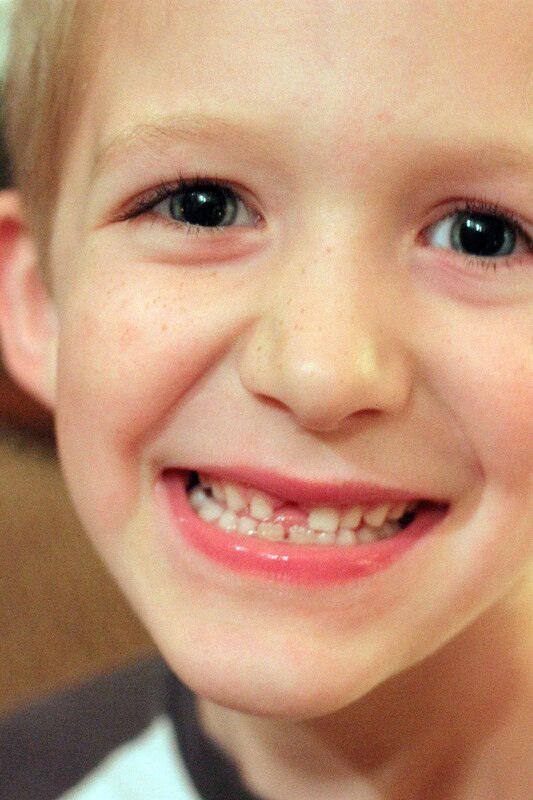 Your eyes and your smile still melt my heart. I love you — even though you lied to me about never leaving me and promised to live next door when you got big. Last fall celebrating their 5th Anniversary…at Disney, of course. It’s been quite awhile since I posted a blog. Thanks to those who have reached out to ask where I am. I haven’t been anywhere. But lots of stuff has been happening in my life. I know some of you are understandably disinterested in the personal details, but for those who are…. In early October we welcomed our 12th little person. Silas Joshua’s entrance into the world was all too slow for Janelle, but the room full of family and friends who weathered his leisurely arrival fell in love immediately. I spent two weeks hanging out with my new grandson and seeking to spoil my Missy. Watching her embrace motherhood with such passion warmed my heart. It’s a powerful experience to watch your child have a child, especially for the first time. And seeing Eric enjoy being a first-time Dad reminded me of how much I miss my own daddy who left for heaven nearly 40 years ago. (How can that be?) For some reason this fall was a sad time for me as I thought about how much Mom and Dad would have loved knowing and welcoming all their great-grandchildren. 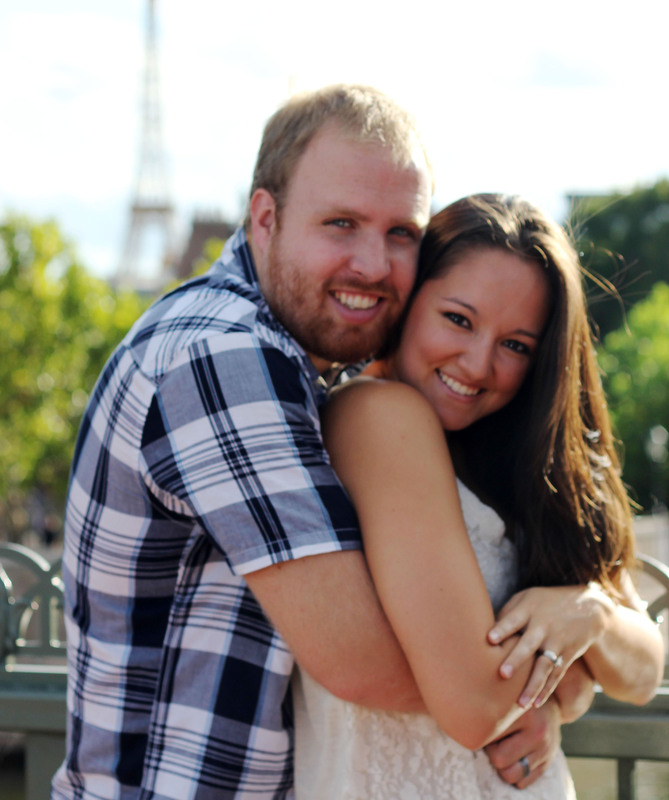 The fall was filled with anticipation and preparations for my youngest son Jake’s December 28th marriage to Sarah. What a joy it was to watch them (umm…Sarah, that is) turn yard sale finds into lovely pieces for their apartment and to experience their growing excitement for sharing life together as husband and wife. As any of you who have watched a son marry can attest, the convergence of the joy of my sons’ upcoming wedding and the melancholic sweetness of his years as “my boy” coming to an official end resulted in a strange roller coaster of familiar but nuanced emotions. 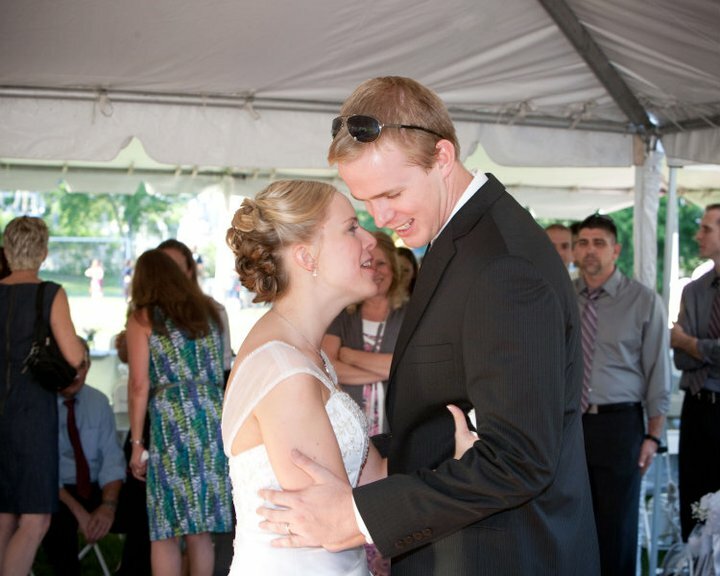 Jake is the sixth of seven of my kids to marry so I’m pretty accustomed to the ride. But him being my last son to marry during the same year I will turn 60 made me feel…old. More on that another time. 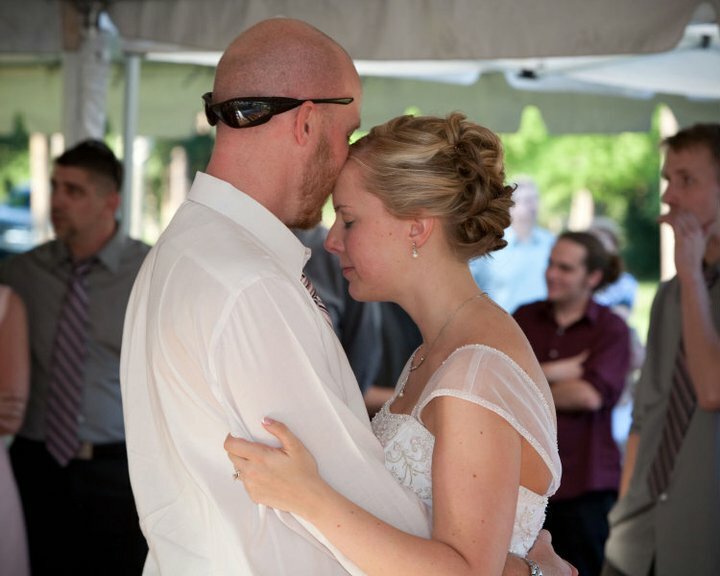 Three days before the wedding brought a surprise for our family. Our oldest daughter Jaime, who typically gives birth a week or so late, called me the morning of December 23rd, about ten days before her due date. “Mom, I think something must be happening. Can you come over?” Gratefully Jaime and PJ live just minutes away. Her biggest concern was the wedding. How could she be a bridesmaid with a 72-hour-old baby??? 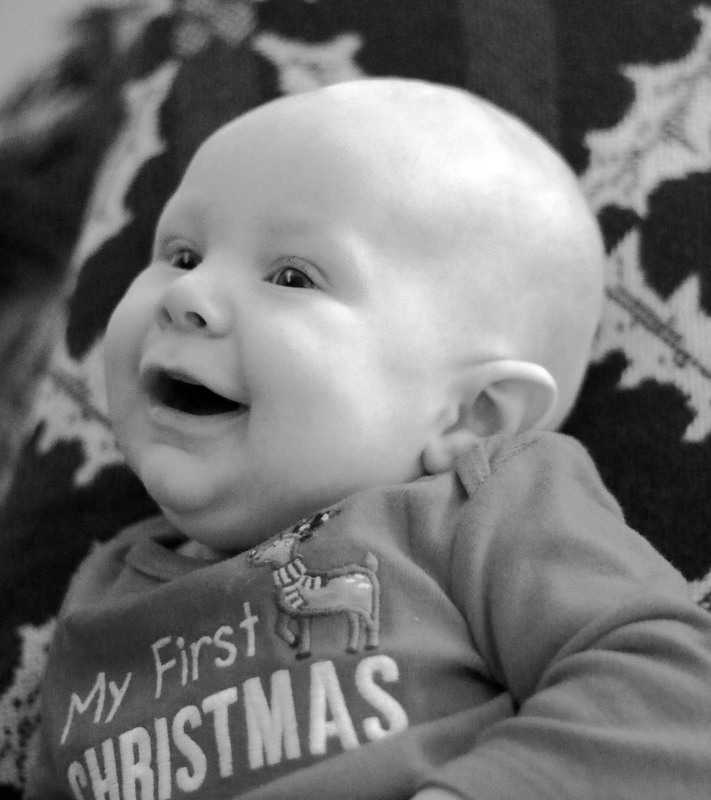 When I arrived it was clear that Caroline Rae was going to be the best Christmas gift a Granma could ever receive. In just a couple of hours she whisked into a room full of eager observers (yes, my girls actually like giving birth in a crowd!) and by early afternoon everyone was off to enjoy their Christmas Eve plans. Benny and I left asking ourselves if we really did just watch number 13 enter the world with just enough time to get ready for our 26 People to show up the next morning for Christmas breakfast? 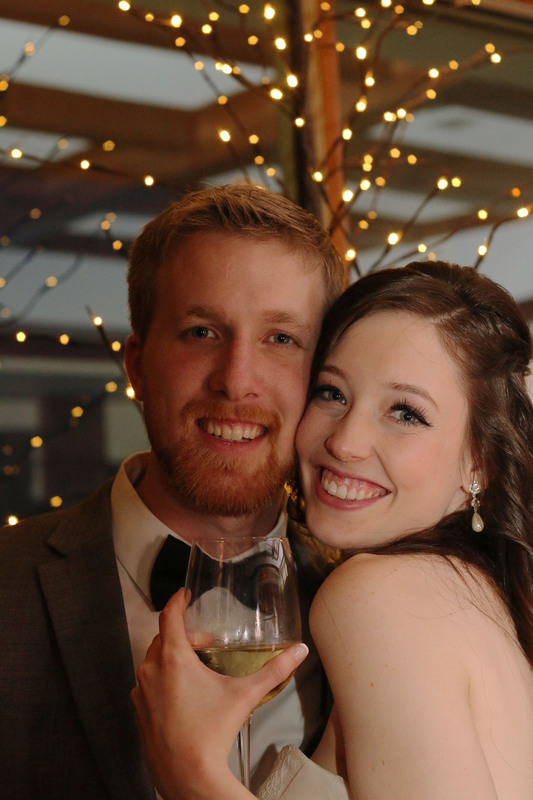 Jake and Sarah’s wedding was a wonderful celebration of God’s faithfulness. 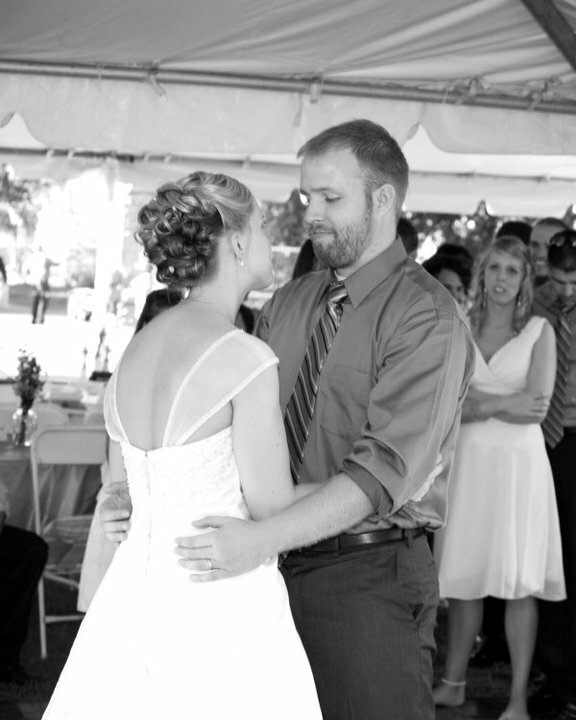 Benny enjoyed the privilege of performing our 6th child’s wedding and PJ worked hard the night before to “hem” one of the layers of Jaime’s dress (with scotch tape) so it would keep his no-longer-nine-months-prengant wife from tripping down the aisle. As I stood in the back waiting to be seated by my handsome and beaming son I realized afresh how forever blessed I have been. The doctor who told my parents when I was a teen that I could never have children didn’t know God had other plans. And that day I witnessed my youngest biological child say “I Do” to the godly woman for whom I’ve prayed for over twenty years. 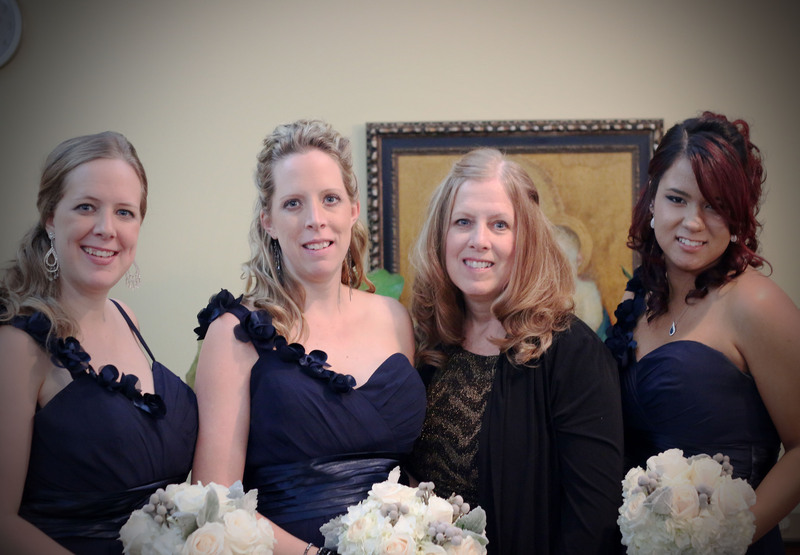 Me and my girls…yes, that’s Jaime 2nd from the left with her husband-hemmed dress. After the whirlwind of two babies and a wedding the reality of life with a daughter still in college, getting caught up on some needed items with my part time job working for my son, ongoing adjustments to having Benny’s mom living with us and the joy of helping two daughters with newborns has left little time for writing. Plus, God has been moving around in my heart about things I will likely write about at some point. In the midst of all the wonderful new things that have been happening in my life there have also been challenges. Isn’t He kind to wisely and lovingly govern both the joys and sorrows we face? Puritan Thomas Watson wrote about pharmacists of the time who skillfully measured just the right amount of ingredients to cure a patients’ specific need. And mixed in with the medicinal items was usually a bit of arsenic. There’s a lesson there: sometimes poison can actually be added to life’s vicissitudes to heal what ails. And over these months I’ve seen that principle at work in my life. Through good times and hard; laughter and tears; joy and sorrow; bursts of faith and bouts with unbelief He has been near. My times of solitude with Him are among the most prized moments in recent months, even though they often happened through tears of joy one moment and sadness the next. A few of you have asked how often I plan to post. I still don’t know. But there are some things stirring in my heart that I want to share. I think the time is right for some of them is soon. I’m sure God has been busy in your life, too. What has He been up to? More on that in the next day or two. Not everyone likes a gushing mom so I know some of my readers will probably skip today’s post. But I just can’t help but introduce you to my son, Jesse. 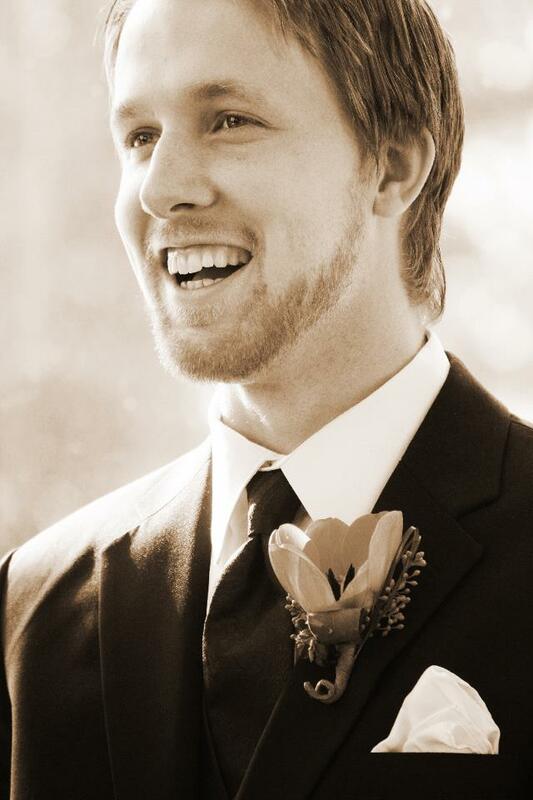 Yesterday was his 30th birthday. I won’t go into the details that only Mom, maybe a couple of patient sisters or a wife would actually care about. But I want you to know that whenever I’m discouraged and wondering if the future will be brighter than the present I often think of Jesse. You see, Jesse came into our lives after two “easy” kids. We never said it out loud but Benny and I thought we were pretty good parents with Josh and Jaime. They were compliant, pleasant and did what they were asked without much fuss. Other than Josh giving his little sister a bath with toilet water (it was clean, thankfully), the two of them “cleaning” the living room furniture with baby powder and then “cleaning” the fireplace by making sure all the soot got onto themselves we had a pretty easy time parenting them. Then came Jesse. 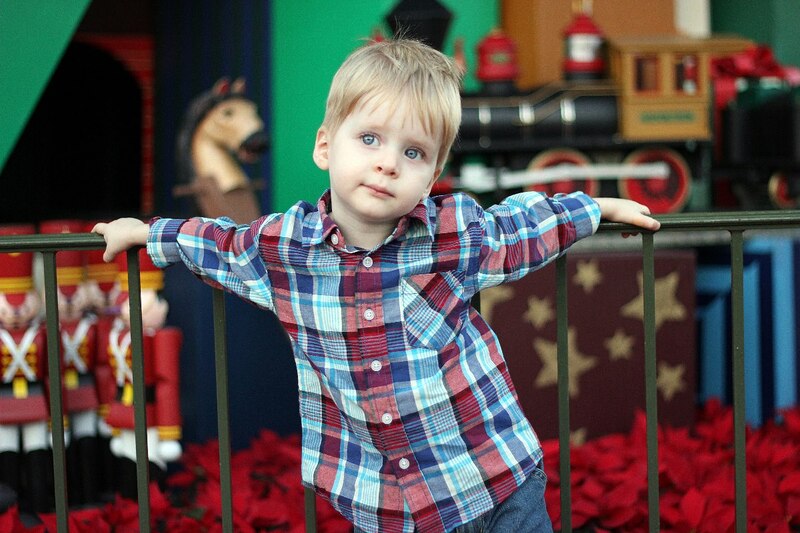 Before he turned two he was throwing violent temper tantrums that left us crying (literally!) out to God for wisdom to help him. God was good to give us this little guy who fell onto the floor screaming in public to deal with any vestiges of good-parent- thinking and left us full of compassion for parents whose kids acted out in public. One day I was in tears on the side of the road, feeling desperate and alone as a mother. I had no more solutions. No more strength. No more hope. The tantrums had been continuing for nearly two years and I was exhausted. Plus, we already had another son and had just found out I was pregnant again. Five kids in 11 years was about to become the end of me. But hope came. WIth tears streaming down my face in the van that day I sensed the still, small voice of God’s comfort in my head assuring me that He was at work in my son’s heart and that someday I would see the fruit of all He was doing. And I have and do. By God’s grace, Jesse is a trophy of His faithfulness. 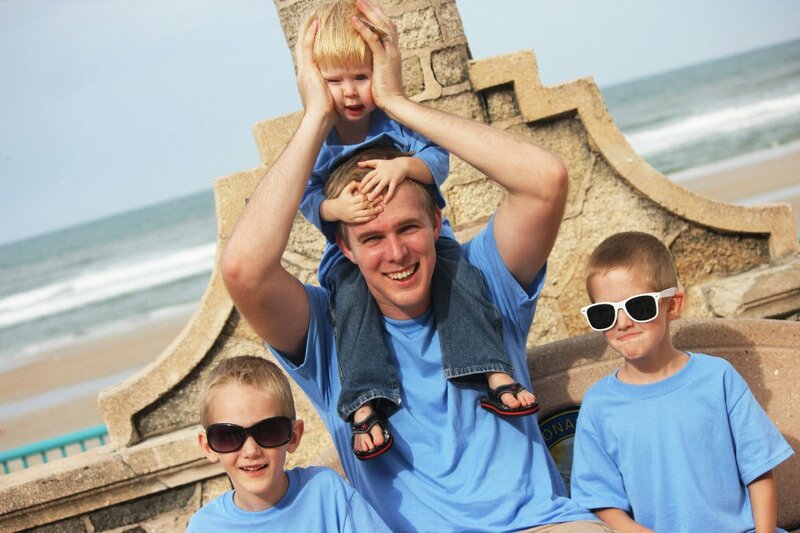 He is a faithful husband and loving father to three adorable boys. Through family trials and wrestlings with the Lord, God grew him; protected him; gifted him; and saved him. He grew in self-control and learned to depend on God to change his heart from one of anger to gentleness. 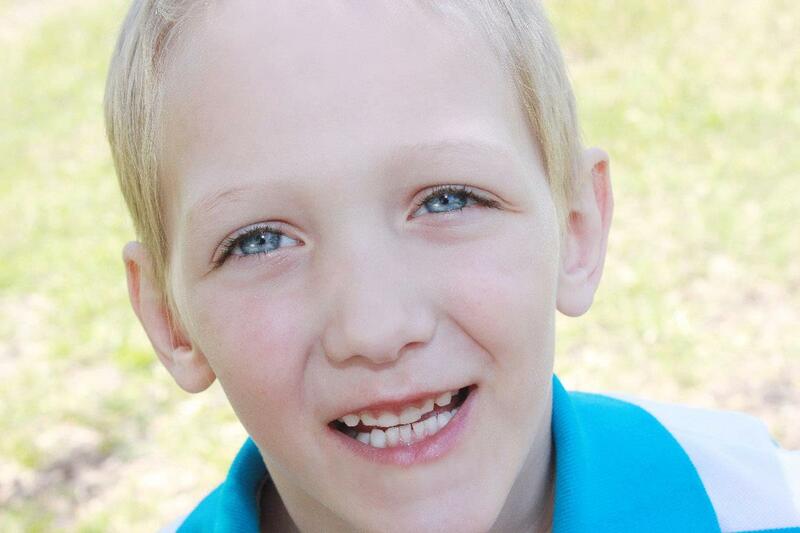 God gave him a heart to honor his parents after years of kicking, biting and resisting us. He has brought this mom joy by filling our home with music and embracing a call to preach. He works hard to support his family as an IT guy and I can depend on a warm hug whenever he sees me. If you have children about whom you are concerned, pour out your heart to God. He hears. He answers. He is faithful. He takes the wandering heart and turns it toward Himself. He transforms anger and disrespect into tenderness and honor. He brings joy following sadness, replaces fear with faith and fulfills His promises even when it takes longer than we hoped. Happy Birthday, son. I loved you when you bit and fought me. When you’d come into our room at night and talk about your struggles and temptations and accomplishments. When you came home and played “My Cheeseburger” on the piano at midnight. When you hit that last second shot and made Cindy and I jump up and down for joy on the bleachers. 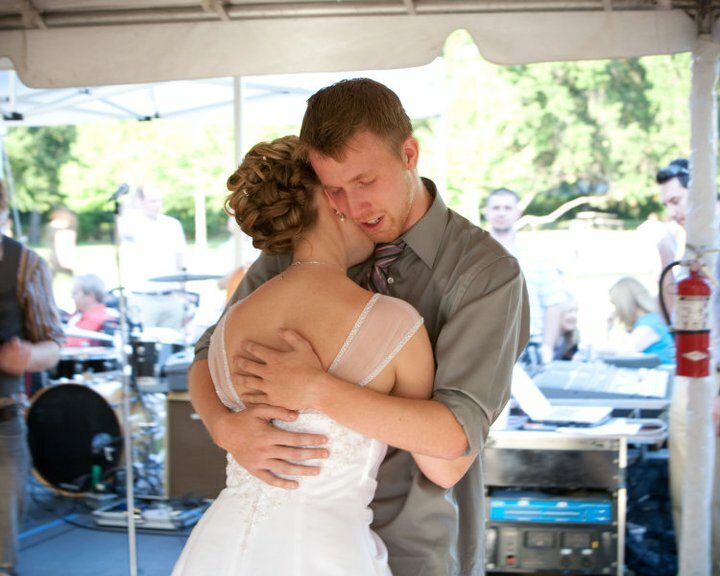 When you told me you were in love and when we shared the dance at your wedding. When you cried at The Columbia when we told you about the PC and when God brought you back to Orlando to live closeby. I love you for giving me three grandsons and for working hard to train them in godliness. But I mostly love you for teaching me that while good parenting is important, the One who is most responsible for growing a kids heart and character is God. You’ve taught me humility both when you threw a fit in the floor at Toys R Us as a toddler and when you shared your heart with me as a teen. I love to watch you love your wife and sons. I learn from your preaching. I value your counsel. And I’m grateful that you’re not nearly as impressed with yourself as I thought you might be. Thirty years from now I will most likely be gone. But every year I get to watch you grow, admit your flaws and failures, love your family and serve God’s people will be a joy. I’m glad God gave you to me, son. And I pray that your life will continue to be an example to me and others that the story is still being written. God completes what He begins…always. This is the final post (for now) in the series on sibling relationships. Joey is pictured here with his wife, Lauren, and our number eleven, Amelia. I’ve been sensitive to the kids putting Benny and me in only a good light out of a desire to honor us. So i’ve edited their posts accordingly. But Joey told me I couldn’t edit his post. I admit it; it brought tears to my eyes. I’m grateful to God for His grace in the lives of two young people who started having kids in the 70’s and had no clue what we were doing…He’s been faithful. Family worship time in early ’88. I want my kids to grow up worshiping together, too. 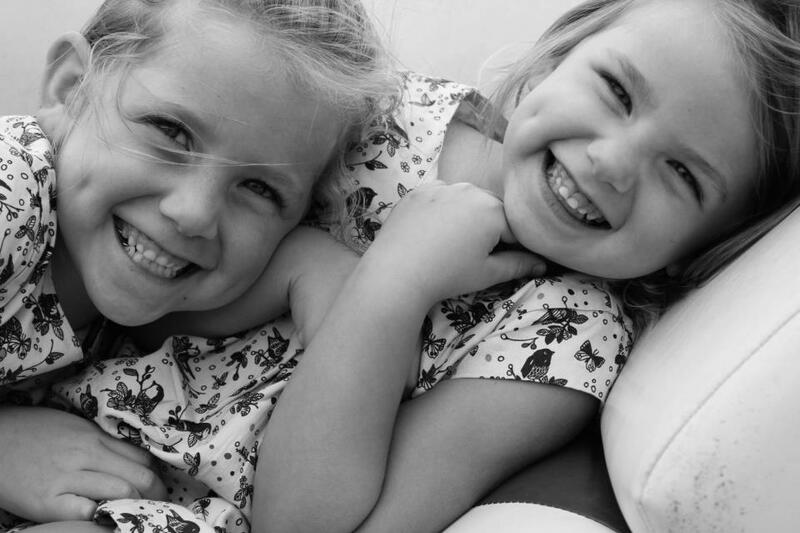 When Mom asked us if we would want to contribute to her series on fostering sibling relationships, there were a few things that naturally sprang to mind. Homeschooling came first, then sports. Mom and Dad drove around most of Virginia, DC, and Maryland watching each of us play basketball; but they also put a court in our back yard to help make our house the place all our friends wanted to be. 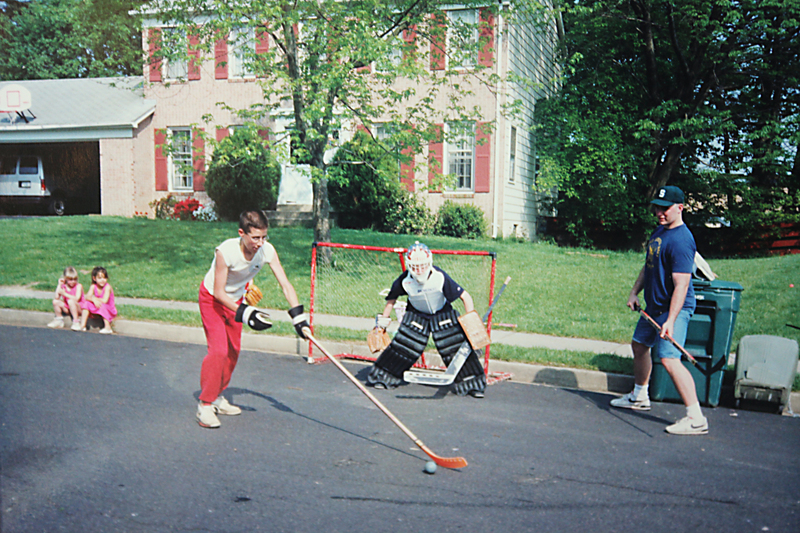 Then there was football, street hockey and 6 on 6 soccer with the neighborhood kids. 6 on 6 soccer in a yard about 15 yards long and 10 yards wide. Oh, and epic games of baseball, played with a tennis ball; the kind of game where if you got a couple men on base you had to go back to bat again, so there were “ghost” runners. 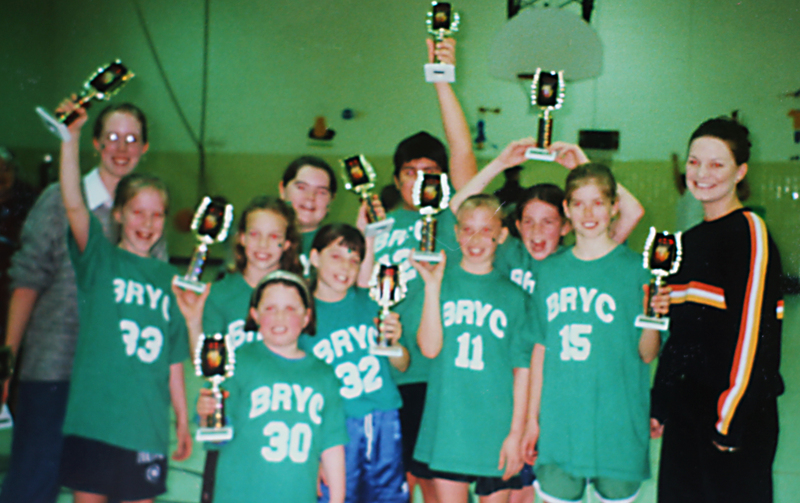 Jaime (far left) coached her sister (Janelle is in front of her) to a basketball championship. Now Jaime coaches her daughter, Kayla. A few other things came to mind, most of which have already been touched on. The more I thought about it, though, the more clear it became to me that there was actually one particular thing about the way that mom and dad parented us kids that contributed to our relationships to this day. They parented with a mission and we always knew what the mission was. Mom and Dad trained us to be respectful, obey them and others in charge, write thank you notes for birthday presents and clean up after dinner. But their primary mission wasn’t obedient and polite kids. Their mission was to bring glory to God. Since the church is the means God chose to display His glory, we knew that glorifying God meant giving our lives to the church. This fostered a sense of teamwork and loyalty that goes beyond sharing the same name and simply growing up together. Proximity and a shared mission are probably the two biggest ways people grow close relationally. Siblings most always have the former, at least initially, but they should also have the latter. We did, and it permeated everything about our lives…and I think that fact is the greatest reason why we grew and remain so close. Let me give some examples of what this looked like growing up. One of many street hockey games on our street. That’s Josh in goal. In 1992 Fairfax Covenant Church, now Sovereign Grace Church of Fairfax, was fund raising in an attempt to purchase property to build a facility. It was called Challenge ’92. Even though I was only 7 years old I can remember the feeling of camaraderie, not just with my siblings, but the entire church. I remember going to the church-wide garage sale that took up an entire parking lot at a school. I remember doing lemonade stands, selling baseball and basketball cards to neighborhood kids, and finding whatever way I could to fill my huge, pink, plastic piggy bank. I remember getting progressively more nervous as the deadline approached for “Miracle Sunday.” I’ll remember that day until I die. When dad walked onto the stage to announce the offering amount my heart was in my throat. When the room erupted I ran around in little circles yelling. It was awesome. I won’t go into the specifics here of the amount needed, and why it was such a miracle that the money was raised in time, but it was amazing. 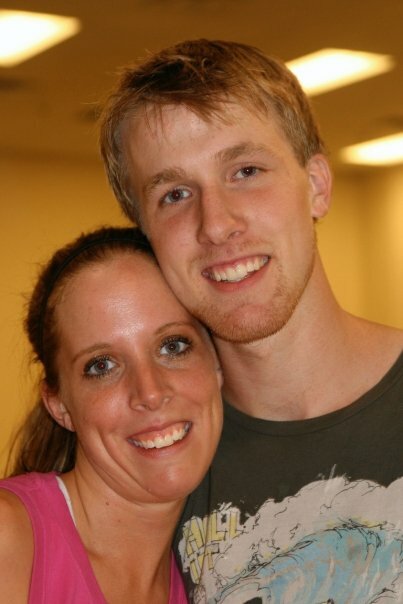 Jesse and I played a lot of basketball together. 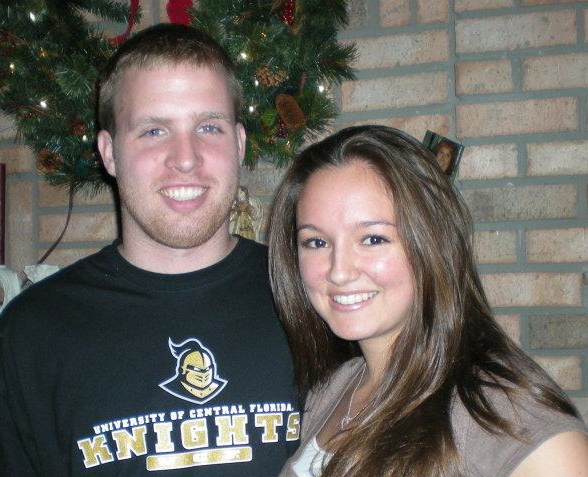 When we moved to Florida we played for a private school and won some games together. Fun memories. That experience helped grow my love for the church. It helped build a bond with my siblings because we were teaming up on something bigger than ourselves — something even more important than basketball. This is easy to see in an example that dramatic. But what Mom and Dad were so good at was teaching us that we were on the mission 24/7. I’ve told the story to folks before of being at a birthday sleepover when I was 11 and didn’t stand up for a kid who we all thought had fallen asleep while guys mocked him. Turns out he did hear the mean comments and was understandably devastated. Mom and Dad heard learned about what happened. I was disciplined pretty good (yes, my parents spanked us) and grounded from a basketball game (the most horrifying punishment). Some might say their response to my cowardice was harsh. That it was not showing “grace.” But I knew otherwise. I understood that discipline is a means of grace. I knew that what I had done was wrong, not just because it was an act of cowardice but because I had allowed another believer to be slandered and maligned, which creates discord and rivalry, which hinders the mission of the church bringing glory to God. And yes, my parents articulated that to me at 11 and I understood and agreed. I still agree to this day. As we grew older, this sense of mission and a desire to serve the church has remained and informs our relationships. It’s why we all decided to participate with them in a new church plant in Lake Nona last January. Not that we couldn’t have participated in the mission while staying at our former church, or that we all have to be at the same church forever (Josh and Jesse both have been members of other churches at various times.) But this was something new; a way we hadn’t been able to serve together before. It was going to force us to work harder, give up more time, spend a lot more gas money, and serve in areas we never had before. Who would I rather do that with than the mom and dad who taught trained me to love God’s church, and siblings who I’ve been on a mission with for as long as I can remember? Leading our church in worship is one of my favorite things to do with my siblings. Being at Redeemer Church now means I can also do this with my wife, Lauren (singing). That’s Jake leading on keys with me on bass. 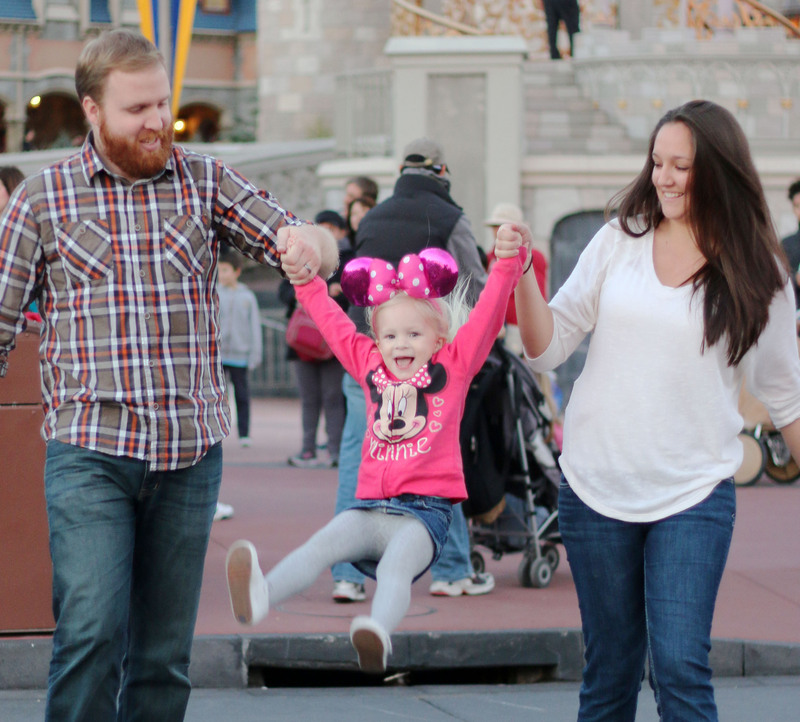 My daughter is almost two, and we are hoping for 6 or 7 more (just kidding Baby Love…just 5.) I want Amelia to have a close relationship with any siblings she ends up with. I want her to have what I have. But mainly I want her to love God, know Christ, and love the things that He loves. As kids, we always knew Mom and Dad cared more about our spiritual state than anything. We knew they cared about us loving the same things they loved because they loved the same things God loves. We bought into the mission because we saw them living it. That mission is the reason we are close. So with my daughter that’s where it starts, too. It doesn’t start with teaching her that family comes first or that blood is thicker than water. It isn’t about raising a daughter that loves her parents and siblings. It’s about raising a kid who hungers for God. Hey, mom and dad you should…oh wait. It was the winter of 1986 when Benny and I got into the van after a sonogram. Back then they were only done when a problem was suspected. The problem had been found. My doctor told me the only thing I could do to prevent what he thought was a pending miscarriage was complete red rest. If I didn’t lose the baby in a week he would see me again. I closed the van door and cried. How in the world was I going to stay in bed for the next week?!? I had four children ranging from 18 months to not quite eight years. My mother and sister lived nearby but had full time jobs. I knew Benny would be helpful but he had to work. 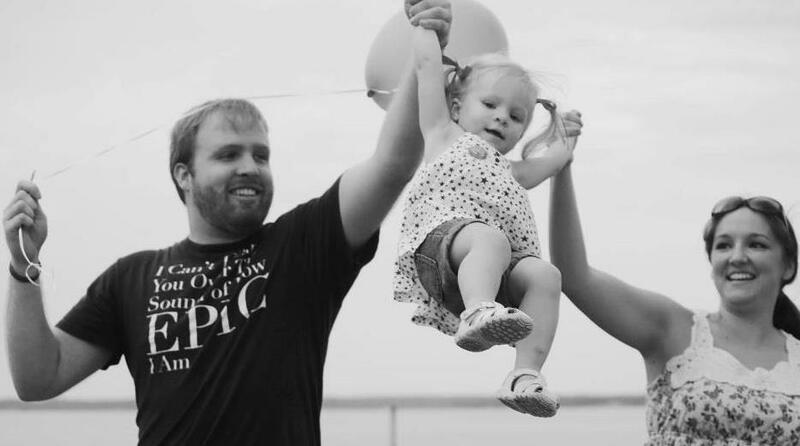 All I knew was I needed to do my part to protect my unborn baby — but I was scared. Who would occupy Joey who was getting into everything? Oh, and potty training with Jesse would have to be delayed…again! Our home schooling schedule would certainly have to change since the only time a bed-trapped teacher could work with her first and third graders was when little brothers were napping. And what about all the other household work of a large family? I realized pretty quickly that a week of Benny trying to keep up with towels and underwear wasn’t so bad. When we got home we sat Josh and Jaime down to talk. At nearly 8 and 6 1/2 we knew they would want to chip in. They were excited about mommy having another baby and a week really wasn’t that long. Gratefully, I had been working with them to learn the discipline of daily and weekly chores for a couple of years. But this was a tall order for my young kids. The hoped-for week of bed rest turned into five long weeks. Friends brought meals twice a week and Benny rolled up his sleeves to help each evening. But the majority of the work fell onto Josh and Jaime to prevent Benny from having to do it all. They decided Jesse really didn’t need to wait until he was three to be potty trained and Jaime was a second mommy to Joey anyway. They made pbnj’s and boxed mac and cheese and carted all their homeschool books to my bedroom each afternoon after they put their brothers down for a nap. They vacuumed; made beds; brought laundry to my bed to be folded; straightened bathrooms; took phone messages (no cell phones back then and the phone was tied to the kitchen wall with a cord! ); rejoiced over little-brother-potty successes; loaded and unloaded the dishwasher using a chair to climb up on counters to reach cabinets; and made sure Mommy had food and drinks throughout the day. The day I finally came home with a sono picture of their baby brother or sister alive and well was a special one for Benny and me. Not only had God spared our baby’s life, but we were also able to thank Josh and Jaime for their hard work and sacrifice. That fall Janelle Marie was born to a very excited older brother and sister. And Jesse was indeed potty trained. 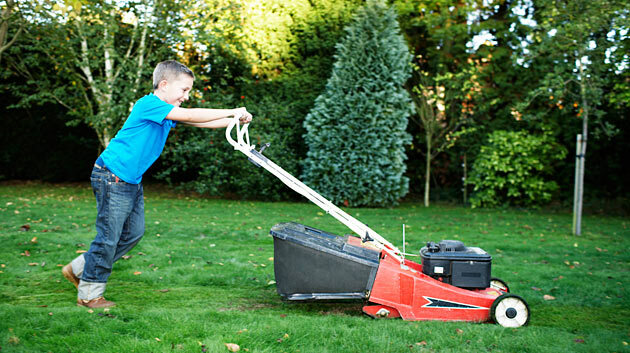 Teaching kids to work in the home has many benefits. You may never need your school age kids to take care of you because you’re bed ridden. And it may take years before you see the fruit of your training. The honest fact is this: teaching kids to serve and work in the home is hard work for Mom! It’s much easier to make beds and clean bathrooms yourself. And dealing with their attitudes when they don’t want to help makes doing it yourself easier. 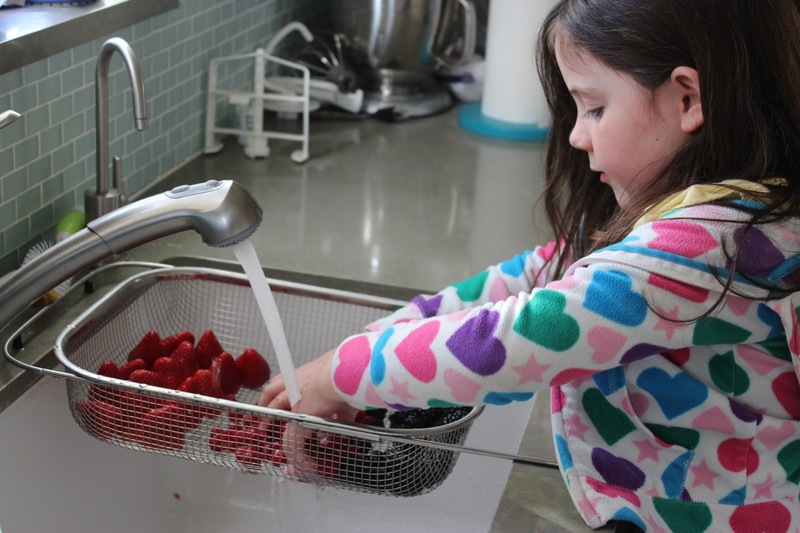 Moms who train their children to serve around the house double the work for awhile. We do our work — and oversee theirs. Moms, teach your children to work. 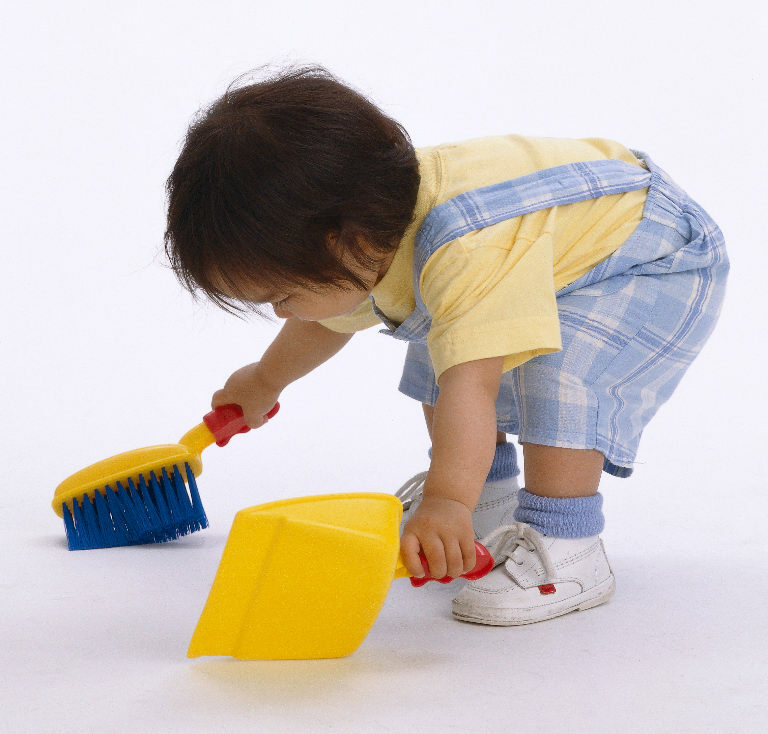 To pick up their toys rather than developing an entitlement attitude that expects others to clean up after them. To help set the table, knowing the silverware will be cockeyed. To make their bed even though you’ll be tempted to go back and straighten it later. And to rake leaves and pull weeds and mow grass and “wash” windows — and then congratulate them for a job well done despite the imperfections. Last night my dining room table had several people sitting around it, including four in our family. It started with taking their plates to the kitchen when they were too short to reach the sink. Now they’re brainstorming about company finances and praying through how to grow ProVisionIT to provide provision for more families in the future. Jesse was right; all play and no work isn’t a good road to the future for your kids. And the future will be here before you know it. This is my oldest daughter, Jaime, with PJ and their adorable kids. 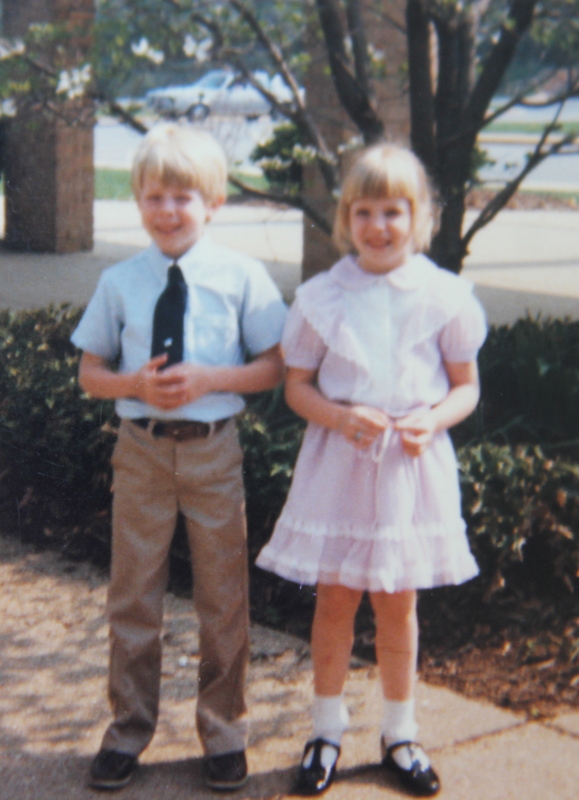 Jaime is guest posting today as I continue a series on sibling relationships. Hey, we’re only 9 and 10 here…so certainly I out grew him soon after this! I’ve always loved my big brother! 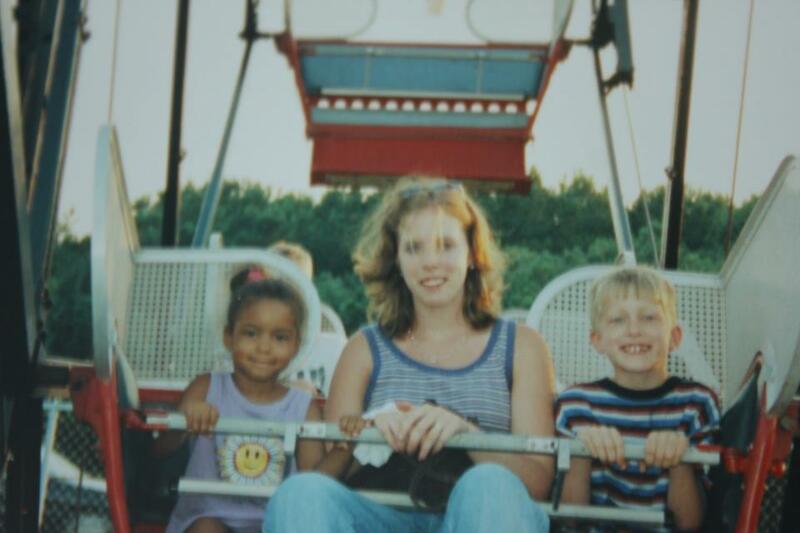 But I am not here to talk about Josh’s past nightmares and bitterness but about how my parents did their part to help us kids to love each other. I used to hear my mom introduce us as her “liter” at times. She would laugh about how we all had to do everything together and never wanted to be alone. I thought she was crazy since, at that time, all I wanted was to be alone. I idolized my neighbor friend, Christina, who was an only child who had her own room; daydreamed about what it would be like to not have Janelle tagging along and breaking everything I owned; wished I didn’t have to worry about Jesse saying something strange and embarrassing me in front of friends or total strangers; and resented Josh being the boss when I did all the work. The reality is, Mom was right. (She loves it when we say that!) Regardless of the moments when I craved solitude or sinless siblings, I wanted them around. This became most clear to me when I got married. I found myself still going to pick up a kid or two to go to a movie, the playground or the grocery store. The age gap lessened and now they really are my friends. Back when my parents started homeschooling there no homeschool co-ops and they knew only one other family in our entire county who was homeschooling. (No, we didn’t live in the hills of West Virginia but in suburban Washington, DC.) Our “socialization” come from each other. We were the basketball, front-yard soccer and street hockey teams; study partners; tutors; field trip partners and debate team competitors. This created an environment where we had to rely on each other for friendship that other kids could easily find elsewhere. Although annoying at times, and something I sometimes greatly disliked, I am grateful to be one of those rare people who is still best friends with those I went to school with. Second, like Jake said on Friday, mom forced us to pursue reconciliation and and to ask each other’s forgiveness. That’s right, she literally forced us to apologize to each other. And she didn’t just make us apologize but also had us look at each other’s eyes and hug one another! Although that may sound like it was “fake” or wrong because it was mere outward behavior, it created in us the habit of righting wrongs. Yes, at 14, when I had to apologize to 8-year-old Janelle (again) for yelling at her, my heart was not all there. I may have been faking my regret, but I was developing a habit of going back and admitting I was wrong. And Missy was developing a habit of practicing forgiveness. Regardless of what was going on my heart at 14, or 10, or 4, that habit turned into a conviction. 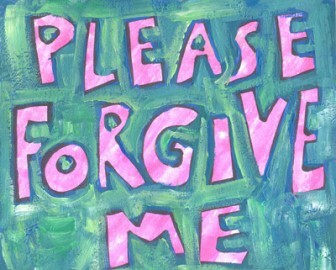 Now I pretty routinely go back and ask for forgiveness when I have wronged somebody – even if I still don’t feel like it. In the process of asking my siblings for forgiveness hundreds of times, we learned that having a tender conscience resulted in realizing we really did love one another enough to “get right” with one another. Over the years I learned my siblings not only know me best but were the first to genuinely forgive me – even and especially when my weakness and sin hurt them badly. I may not have had the full regret and remorse of my actions at 14, but at 18 my actions rocked my sibling’s world; yet they were eagerly waiting to forgive me. That heart continues. Last week I reacted impatiently and harshly to my brother, Joey. When I called to work things out with him he responded with,“I know you and knew we were already fine before this call.” We may not have been so quickly “fine” as young children, but the practice of having to humble ourselves and be reconciled (at least on the outside) — instilled in us by my parents as young children – means now that we’re adults an apology isn’t even always required to forgive one another. Through the many trials through which our family as walked, many people came and went. I’ve learned (the hard way at times) to rely on God, my parents, and my siblings…no matter what. The trials were small when we were young (like having to share a room with my little sister) but as the trials have grown we now run to each other to reconcile. Finally, and what might sound a little strange, is this: my parents told us to be and act like friends. I can’t count the number of times we had conversations about the importance of friendship with our brothers and sisters. As Mom has mentioned, she learned this from my Nannie and her siblings. I hated the “I dream that someday you and Missy will be friends so you need to start treating her like one now” comments. I listened politely but argued in my heart. Yet, it had an affect. I was a mean sister to her. But even when I thought I had damaged my relationship with Janelle too much, I had a glimmer of hope because Mom said it could happen. Biting and hair pulling? These two cuties? Yep! But they do love each other. Recently he surprised me by driving back from law school late one night…I love it when I hear him come through the door. Days later I heard Danae tell someone that Annie would be her best friend. I smiled. I smile when I hear Kayla say the same unkind things to Annie that I did to Janelle or treat Wyatt the same way I treated Jesse. Why does this make me smile? Because I know that they are getting to know each other. They will know each other’s shortcomings more than anyone else. I smile more when I see them playing basketball out front together, or watch Kayla help Wyatt with math, or listen to one of them try to convince everyone to get in to pool because it’s more fun to all be together. I hear Mom in my own voice when I explain to Kayla that Wyatt is way younger than her now — but someday she will probably get really excited when she hears the front door open and realize it’s him coming over to talk about politics or sports or to watch a show with her. Yeah. Like when our hearts jump because Uncle Jakey just walked in. 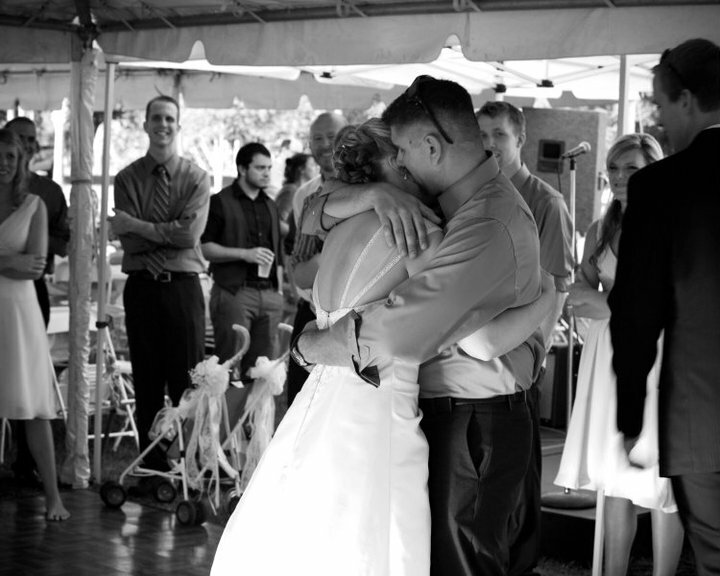 My husband, an only child, now benefits from the relationship with my brothers and sisters as well. They are his brothers and sisters and his best friends, too. I’m thankful that Mom and Dad homeschooled us, forced us to forgive (and love each other at times), and told us to be friends. Although it was certainly annoying as a child, I am now annoying my own children with faith that one day the first person they call when something annoying, happy, sad, devastating, or just random and funny happens is one of their siblings. So What is Family “Closeness”? As the sibling relationship series continues, I want to offer some heartfelt thoughts…and cautions. Any time family relationships comes up it stirs emotion. One of my readers asked the excellent question, “What do you mean by close”? What if your closest relationships are with those outside your family and everyone is fine with that? Is family closeness something for which we reach and seek to build, or something we trust God to do if He chooses? Does the Bible require biological families to be best friends? Is He more pleased with siblings who would rather vacation with each other than with anyone else? Family “closeness” varies. There is no biblical definition of what family relationships should look like — except that the Bible is clear about how Christians should treat one another. We are called to love. Serve. Encourage. Rebuke. Be patient. Forgive. Be humble. Confess faults and sins. Be affectionate. Believe the best. Not be critical. God’s righteous demands are required of all of us in every relationship, including with our family members. Whew. Hard stuff. Living this way is only possible because of the help provided by the indwelling Spirit of God! But because He died and sent the Holy Spirit to live in us, we have the power to obey Him. And to be forgiven when we don’t. This series is for parents. It’s not designed to address the many aspects of adult sibling relationships. Nor is it meant to define what sibling closeness should look like in every family. We can only be certain on what something should “look like” when the Bible is clear. As parents, we usually want everything about our kid’s lives to be better than ours. We want to help the avoid youthful sin; have more money; get a better education; struggle less; make fewer mistakes; suffer less; and be close to their siblings when they grow up so we can all have Norman Rockwell Christmases together. Whatever we do now doesn’t guarantee results later. Adult children make their own decisions and sometimes choose to forsake parental instruction to go their own way. And sometimes God uses the very trials we want them to avoid to be the conduit through which grace and change come. The simple fact is your five and seven-year-olds might agree now to be besties when they grow up, then end up living on opposite sides of the country and rarely communicate on a deeper than superficial level. Dear friends, Bob and Julie, and their expanding family. Such precious memories of our years together in northern Virginia. Our oldest daughters remain dear friends to this day. Please don’t read my words — or the words of my kids who are contributing to this series– and think we are trying to paint a picture to hang on the walls of your home. Honestly, just doing this series has reminded us all of the “dangers, toils and snares” through which our family has walked: things that could have divided us rather than held us together. And as Jake said on Friday, we know many families who have strong and close relationships (like a family we dearly love pictured here) and don’t see our family as unique or special. So, no, every family doesn’t have to share our definition or practice of closeness. But every parent who professes Christ as Lord has a responsibility to not only uphold biblical principles in how we treat and love others (help, Lord!) but to also teach our kids to do the same. What better place to begin and practice than in our own home? Believe me, our family doesn’t take our relationships for granted. In fact, we’ve been tested enough that we sometimes marvel at God’s faithfulness. I was raised by a mother who showed me what a family legacy can look like when people decide to love each other through sin; disappointment; grief; gossip; critical judgement; distance; and all manner of offenses. Then He gave Benny and me seven kids who we dared believe could emerge from a childhood fraught with common sibling meanness, bickering, jealousy and selfishness with friendships purified by forgiveness and loyal love. My hope in doing this series is to cast “a” vision — not “the” vision — for doing the hard work day in and day out to train children to obey Biblical commands for how to treat their brothers and sisters. Our parental role can’t be results driven, but obedience-to-God driven. I know godly parents who worked hard to build a culture of love between their kids, only to see them walk away from the family altogether. The comfort these parents have is they did their best to teach the Bible’s one anothers to their children. Through disappointment they are learning to understand the story is not over for them or their children. 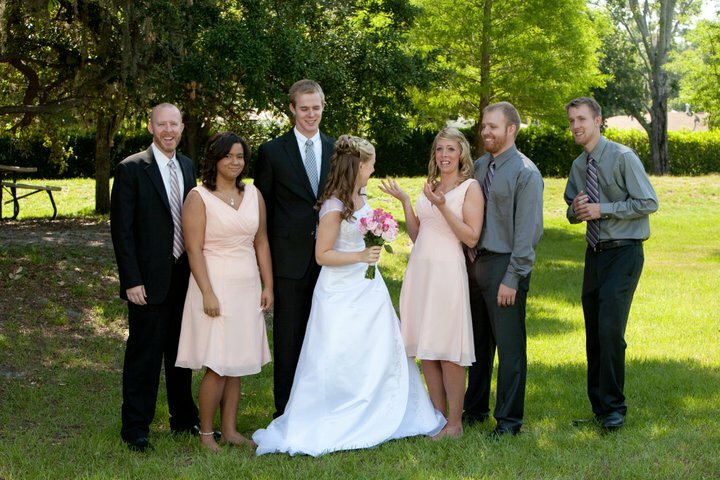 Our oldest daughter, Jaime, has four children. 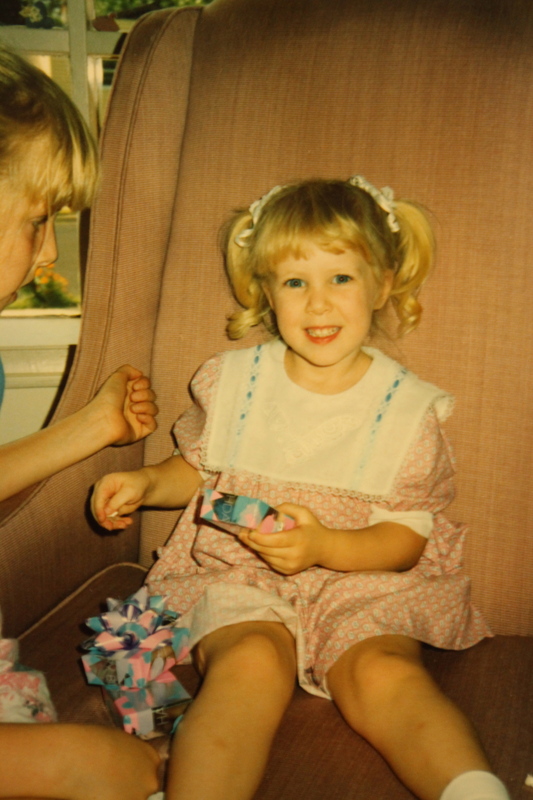 She learned a lot about how to manage a home and family by being Mom’s helper when she was growing up. She also learned that having daughters who bite and pull each other’s hair is nothing to worry about as long as they are “forced” to love each other. You’ll read her story tomorrow. Inviting my kids to contribute to this series was risky. Smile. You’re about to read why. Let the mocking begin — Sheree. This post is written by Jake, a first-year law student at the University of Florida and number six of my seven J’s. His smile has brightened our lives for 23 years. When Mom asked my siblings and me if we wanted to contribute to her blog series, my initial thought was “Of course.” What young parent wouldn’t want to learn from my experience and wisdom? As I thought about it, however, I was at a loss. Like many families, we are very close and love each other. I also recognize that the desire to have children who love each other is common, and the potential that they won’t have close relationships growing up is real. So what did my parents do when we were young to foster good relationships? The problem is, most of what they did was for the purpose of fostering good relationships among their kids; and when everything you do is at least partly motivated by a single goal it’s hard to point out specific, tangible things. What I settled on, though, was the importance of forgiveness and repentance. Let me explain why. My theory is that brothers and sisters, all things being equal, will naturally be close. A quick survey of pop culture, history and society shows that even non-Christians agree that siblings should have close relationships. (See movies like Brothers, Lawless or Boondock Saints, or songs like Murder in the City by The Avett Brothers.) Not that they always will; but if they don’t, it’s usually because something went wrong. In other words, how often, either among people you know, real situations among people you don’t know, or in movies, do you hear the attitude, “Oh yeah, my siblings are alright I guess. I like them well enough, just not enough to really ever want to take time to see them or talk to them or care about their lives. They’re cool though.” Usually, either they’re close or something particular happened that broke the relationship. This, I think, is supported by the fact that the Bible has relatively little to say specifically about the fostering of sibling relationships, yet the Bible also says “there is a friend that sticks closer than a brother.” It seems, then, that despite having relatively little to say about the subject, there is an assumption that brothers (and, I would think, siblings generally) will be very close. After all, that statement only means something if brothers are close. It doesn’t mean very much if that verse simply meant “there is a friend that will pass a very average bar and will be moderately important to you.” If I tell you “there is a person in the world that is cooler than Josh Phillips”, that doesn’t mean much. You’d probably say “Yeah, no kidding, Sherlock.” But if I say, “there is a person in the world that is cooler than Sam Jackson” that actually means something. You’d probably find that very hard to believe. If “closer than a brother” is analogous to the coolness of Josh Phillips that verse means nothing. In that scenario there are probably LOTS of friends closer than a brother. But if it’s analogous to the coolness of Samuel L. Jackson, a.k.a. the coolest human ever, then that verse means something. It would be incredible for a friend to be closer than a brother. It seems as if the assumption that siblings will be close is a biblical assumption. Therefore, for siblings to not be close, in most situations, means something has to go wrong. Unfortunately, we live in a world wrecked by sin, which means that something will often go wrong. Siblings will sin against each other, eventually become disillusioned, bitter or cold, and relationships will either quickly or gradually become unimportant or farcical. How do we avoid this? Since this is my shot, this post isn’t even half done. I hope your patience will be rewarded…. I’m sure there are many ways to keep kids close. But I believe the main way our parents helped my siblings and me avoid drifting apart is by stressing forgiveness and repentance above all else. See, we can’t stop something wrong from happening in our relationships; we can, however, make sure that those “wrong” things don’t negatively influence our relationships. My siblings and I have sinned against each other more times than I care to remember. When I was 7, Joey would get SO angry at me just because I would crush him at Madden ’95. When I was 8, Janelle would lie and say “her knee hurt” every time we played basketball, just so she could go inside and read Anne of Green Gables. When I was 17, Josh would get angrier at me than at any of my teammates when he was my coach. See what I mean? See what I had to go through growing up? If Mom and Dad hadn’t shown me the importance of forgiveness, I probably wouldn’t even talk to them anymore. In all seriousness, we did and do sin against each other…often. That’s the “something went wrong” I was talking about earlier — the types of things that inhibit what would otherwise be a naturally close relationship. Since our earliest years Mom and Dad, as well as Nanny, Bobi, (Mom’s older sister) and many others both articulated and exemplified the importance of forgiveness. When we were younger it was as simple making us apologize to each other every time they heard angry words or selfish attitude, even over simple things that didn’t seem like that big a deal. Even though our apology was sometimes forced (and I’m sure they knew that), the important thing was us getting into the habit of recognizing the importance of repenting and then receiving forgiveness. As we got older, it became less about the routine of repentance and forgiveness and more about learning how a lack of forgiveness leads to bitterness, anger, disillusionment and a whole manner of ugly things that affect you more negatively than it does any of the siblings that you are angry at or bitter towards. Of course, it’s important to realize that it hurts them, too. But it’s more important to realize that it’s destroying your own soul. There is more that could be said about the importance of forgiveness. Perhaps it can be expounded upon by one of my siblings who basically sit around all day doing nothing (Jaime), or maybe one of my siblings who basically do nothing but take vacations all the time (Josh), or sit on their recliners getting more Gramps-like by the day (Joey), or have nothing better to do besides watching Walking Dead or some creepy make-up show (Julia), or listening to Glenn Beck (Jesse), or laughing really loudly and annoyingly (Janelle.) Any of them would probably do a better job than me. All joking aside, I can make fun of my siblings (instead of actually holding those things or actual serious things) against them because forgiveness has been fostered in our relationships from a young age. My siblings have shown me forgiveness my whole life and, by God’s grace, I’ve been able to forgive them or overlook their sins against me. My love for and loyalty to my siblings is possible predominantly because of God’s undeserved grace, of course, but also because it’s not colored or inhibited by a ledger of sins I’ve kept against them. I hope that doesn’t sound arrogant or superior. I love my siblings and would do anything for them; I know this is only possible because of a spirit of forgiveness. I don’t think it’s arrogant or superior because I don’t think that I’m necessarily unique; lots and lots of people have extremely close relationships with their family because that spirit of forgiveness is only possible because we serve a forgiving God. The only things I want to stress is that a) I genuinely believe your children will have close relationships unless something goes wrong, and b) the best way you can help them is to stress the importance of forgiveness. (It is not the scope of this post to talk about trusting God and all that jazz, even though that’s obviously exceedingly more important.) Your children will sin against each other, sometimes in ugly, heartbreaking ways. And although I’m sure this is discouraging for you as parents, remember that your children have the perfect example of how to extend forgiveness. When their siblings sin against them, point them toward that example. Dealing with the sin itself is important, but much, much, much more important is helping both the sibling doing the sinning and the sibling being sinned against recognize they have a Savior that provided the opportunity for all their sins to be forgiven; then He offered a way for them to maintain a close and beautiful relationship in the midst of a sin-wrecked world and their sin-wrecked hearts. And, with any luck, you may even find them to be cooler than Sam Jackson. 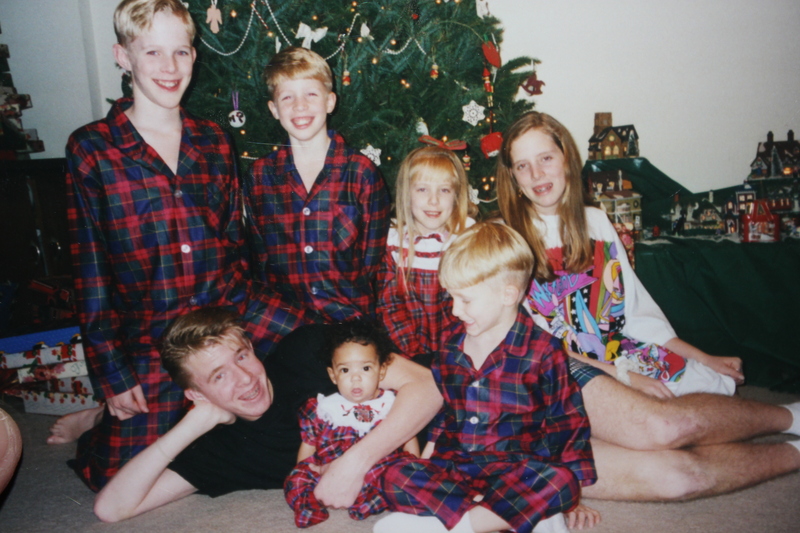 It was apparent to me from a young age that those eight siblings were close. We spent many Sunday afternoons at Aunt Vergie’s laughing over repeatedly told (and embellished…smile) stories of family life in rural southwest Virginia. 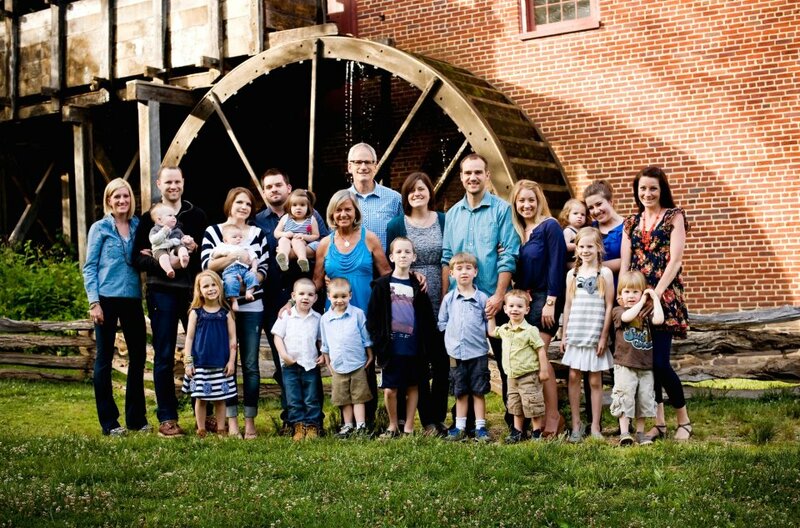 Most of my 25 first cousins lived within an hour of each other; when we got together food and laughs abounded. Most days when I was growing up I overheard Mom talking to at least one of The Sisters. I could hear her laughing from wherever I was in the house. And sometimes I could also hear her fussing over something that had happened in the family. Mom’s three brothers were all younger and two of them spent a lot of time at our house eating, living there temporarily and yes, laughing. My Uncle Alvin once showed up with an anteater he won in a card game. I don’t think my brother Randy ever forgave Mom for not letting him keep it. I was twelve when Uncle Alvin was severely burned in a house fire in the late 60’s. Mom spent day and night at this side watching him suffer an agonizing death. One night after the funeral I found her sitting alone in the dark crying. It’s my first memory of Mom telling me how important it was to stay close to my siblings. Mom didn’t know then that my older brother would break his neck in a swimming accident at age 21 when I was 16 — just when I started learning what she meant. When Randy died six years later I knew I had lost a lifelong friend. Three years after his death, our first miracle baby was on the way. I started praying that Benny and I could carry on Mom’s legacy of sibling closeness while I was growing our firstborn son. 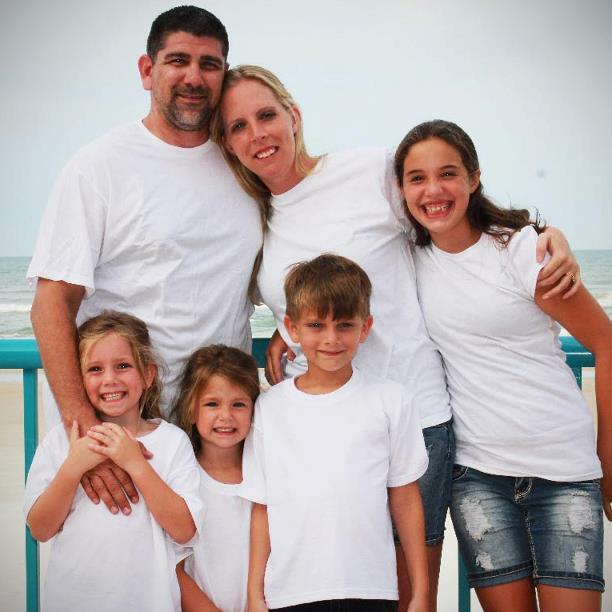 God knew then what I didn’t: this medically infertile woman would become the mother of seven. The youngest of the seven that I once looked down to is now eighteen and before long her oldest brother will be 35. As I typed this post over the weekend, three of them were sitting in the family room playing some old Nintendo 2 game. Yesterday a bunch of us watched the Redskins game together (while Benny texted with Jake about two hours north at law school) after spending the morning serving and worshiping together at Redeemer Church. 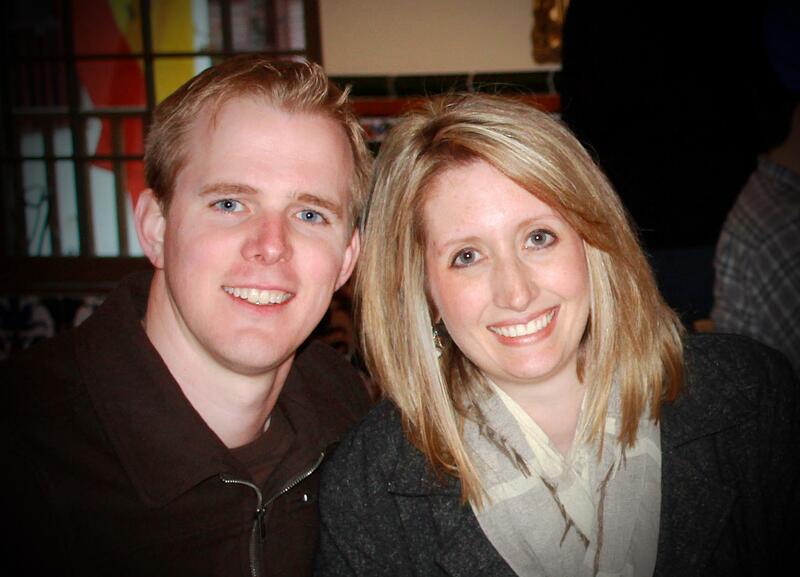 Living within five minutes of each other has been a meaningful expression of the kid’s desire to stay connected to each other — and allowed Josh and Rach to ask Jaime to expand her little home school to include their two school-aged kids. People regularly ask us what we did to foster closeness between our kids. That’s the reason for this post today; the first of several in a series on sibling relationships. They see the love and loyalty between our seven J’s and wonder what they can do as parents of younger kids to create a culture of family affection amoung siblings who fuss and fight more than they hug and kiss. What people don’t know is about the time I called Benny at the office to inform him that toddlers Jesse and Joey were having a fist fight over matchbox cars. Or the night Janelle was in tears (again) over mean things her brothers said or did, resulting in Rachel confronting her adolescent brothers-in-law. Or the damage arrogance and unkindness between Josh and Jaime produced in their teen years. Or the times proud, insensitive or angry comments have required apologies between adult siblings as recently as this past weekend. In addition to the common challenges our large family has experienced over the years, there have also weighty trials through which we have walked when sin (ours and others) threatened to tear our family apart, but became the Spirit-born glue that miraculously forged a deeper bond between us. I think there are things parents can do and not do that help create a culture of loyal love between siblings. I will share some of those things over the coming days, not because our family is perfect or we’ve discovered a formula for making sure we stay close. Honestly, I think we have some things to offer for the very opposite reason: we’ve messed up, hurt one another, asked forgiveness and found hope in gospel-reconciling truths available to every Christian. A couple of readers suggested that I involve some of our kids to share their thoughts and experiences. I’ve invited any of our children who desire to weigh in to talk about whatever is on their heart — good, bad or ugly — that might help parents of still-at-home kids to prize one another as lifelong friends. So far three of them have said they would love to talk about the joys and struggles of being raised by parents who “made them” love each other. But let me say this: there are two things to which I most attribute the warm relationship between my kids today. First, the advice a mother gave to her 12-year-old daughter over four decades ago; advice I watched her live out all her life with my uncles and The Sisters. And, second, God’s faithfulness to answer the prayers of some young parents who dared to believe that kids who said and did mean things to each other would end up carrying Mom’s legacy into a new generation. I once heard someone say, “If you aim at nothing you’ll hit it.” Encouraging close relationships among your kids requires having a vision; something at which you are willing to aim and then pray your heart out that God will empower your efforts to do your part. Mom gave me that — and I hope to pass it along to you.